The United States, Russia, the United Kingdom, France, Italy, Chile, Spain, and the United Arab Emirates are some of the countries which have already discovered the details of the KRION K-LIFE material, the solid surface from PORCELANOSA Group which contributes to improving our quality of life. On this occasion it will visit Shanghai, the city with the largest population in China – over 20 million inhabitants. It is a vibrant, dynamic city with endless social and cultural life, coming together in a multitude of spaces. 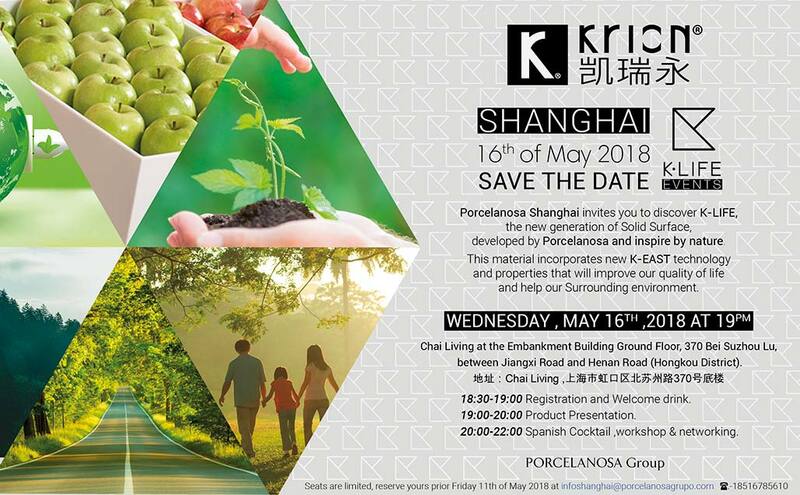 One of those which sets trends is CHAI Living, where the official presentation of K-LIFE in China will take place on the 16th of May. Built in 1935, the Embankment Building is home to CHAI Living, where contemporary style and luxury are perfectly combined with traditional Chinese culture and local life. What better space to present K-LIFE than this building, a landmark in Art Deco in Shanghai, located at the heart of one of the most polluted cities in the world, where our material K-LIFE will contribute to improving our quality of life?